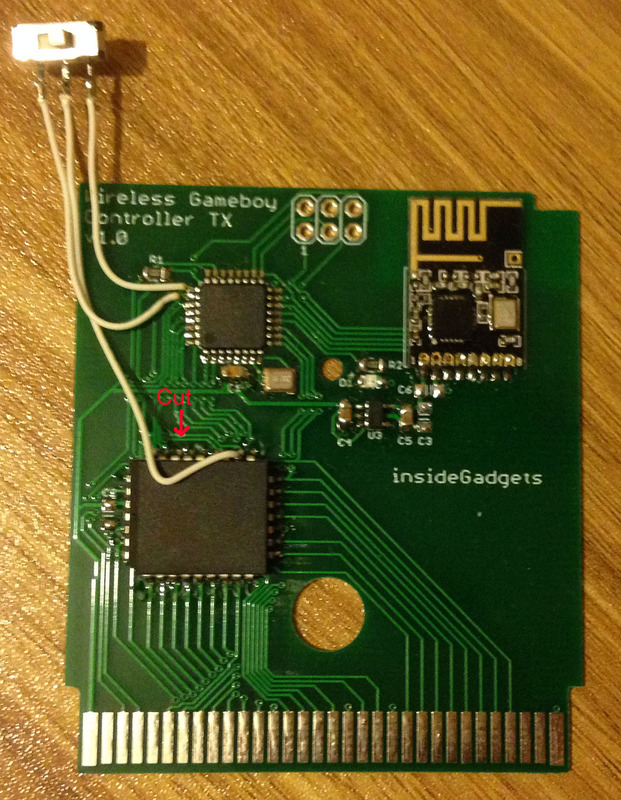 Previously we added NES, WiiMote, N64 receivers and a Multi-RX Adapter for the Wireless Gameboy Controller. 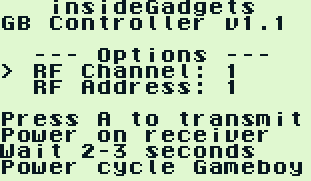 I think that pretty much covers all the receivers for now so I thought the next stage, while not related to the Gameboy directly, is to add transmitter sides to the receivers for NES, SNES, GC and N64. Today we’ll look at the SNES transmitter board. I want it to be as simple as possible to install, not like some others where you might have to wire up each button to the board, instead make it just query the SNES controller like a SNES console would. 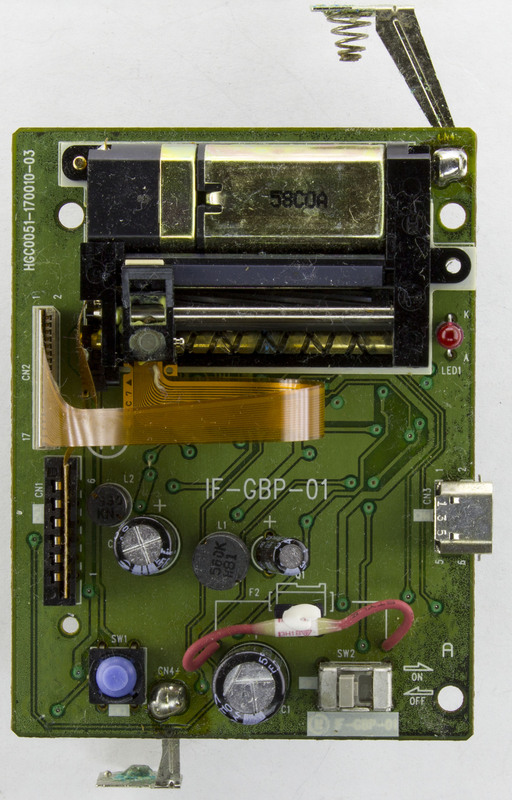 It would be neat to make an actual drop in replacement PCB – maybe something for the future. For the moment, it would mean just 5 wires to hook (Vcc, Gnd, clock, latch, data) up plus the LiPo battery, speaking of which, we’ll put a LiPo charger on the board. For the MCU, I went with the cheapest and smallest option I have used before, the ATtiny48 which can run at 8MHz. As you can see by the PCB design, I tried to make it pretty compact and not too wide which worked out quite well. Upon testing a SNES’s controllers current consumption it’s a few mA so we can’t just leave out the SNES controller running all the time. We can choose to have a switch to turn everything on or off or just use a P mosfet instead – to keep things as nice as possible with minimal cut outs, I went with the P mosfet. But now we have to consider how to wake up, should we wire up to one button or can we do something else? 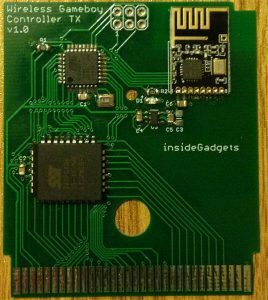 Previously we made the GBA TX Cart for the Wireless Gameboy Controller so now it’s time to keep adding more receivers to the project. We have the NES, WiiMote (which should also support the NES/SNES Classic Mini), the N64 plus a Multi-RX adapter which allows you to switch out systems for a lower overall cost. As I didn’t have an NES to actually test with, I previously had purchased a Mayflash NES/SNES to WiiMote adapter so I should be able to use that to make sure it works correctly. 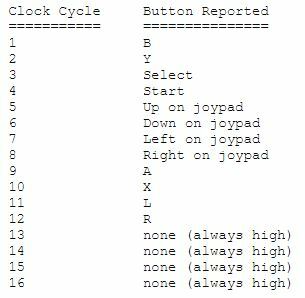 As the NES just uses 8 clocks instead of the SNES 16 clocks that’s pretty much all that needed to change. A quick verification and test and it was all ready to go, I had even named the PCB “NES/SNES RX” before hand. Since I had the Mayflash WiiMote adapter as mentioned, I started looking at it with the logic analyser whilst reviewing different websites to verify their data against what I was seeing with the logic analyser; in some parts they were correct and in other parts they were slightly off. I won’t bore you with the details but I did get pretty far into it with an ATtiny, up to the point where everything was sent/received in the clear but then it came to the encryption stage. I thought perhaps if I don’t reply to those encryption requests, etc, it may bypass the need but it didn’t seem to be the case so that’s when I decided it was time to look to see if someone had released some code for that. 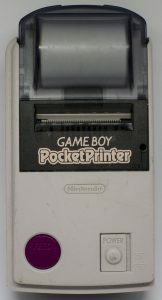 Keeping up with the recent Game Boy related posts, today we’ll be taking a look at the Game Boy Pocket Printer (MGB-007) which connects to the Game Boy via the link cable and is powered by 6x AA’s. The thermal print head/motor assembly looks very similar to the one used in the Thermodrucker Printer. Capacitors are decent branded Sanyo/Nichicon ones. On the back, we have ourselves a bodge wire. The battery terminals are starting to corrode. At first it looks like all the vias have corroded but on closer inspection, it’s a green via tent, couldn’t be corrosion as there is a pad named “TP1” which is bare copper and that’s looking fine. 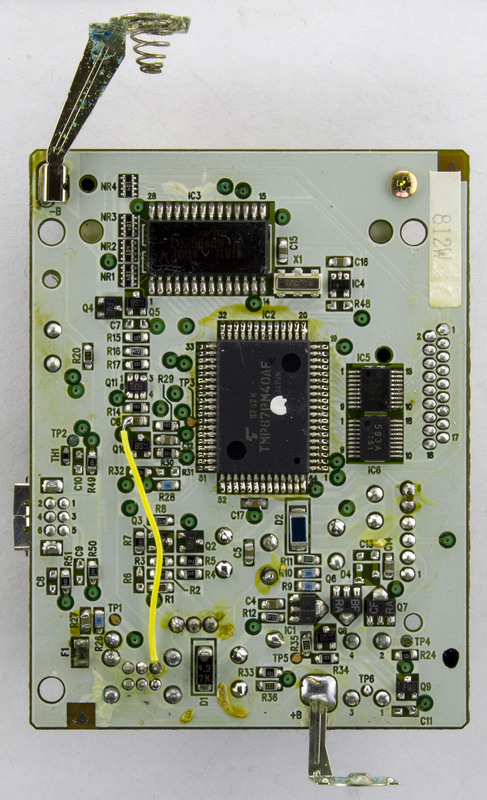 There is some weird solder mask corrosion/fading starting on the edges of the board. 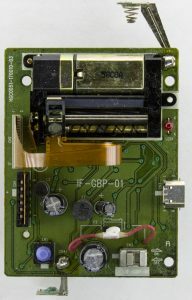 Previously we made a Super Nintendo receiver for the Wireless Gameboy Controller but it would nice to add L & R support so that some games on the SNES could also be playable and it would also allow GBA games to be played which used the L & R buttons so that’s what we’ll do, make a GBA TX cart. 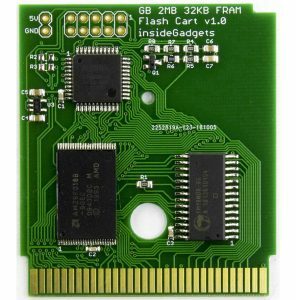 One of the problems is the GBA carts size, it’s half the size of the Gameboy cart so we don’t have a lot of room to work with and we need to fit a CPLD, flash chip, AVR MCU and the nRF24L01+. After a bit of browsing around trying to find the smallest CPLD & MCU, I came back to the Altera 5M80Z which I was looking at for a flash cart but didn’t go ahead with it due to the 0.4mm pin pitch but it’s basically the only choice. 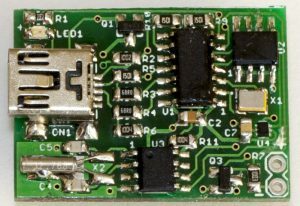 For the AVR MCU, it doesn’t need a whole lot of I/O or anything special, so I settled with the lowest cost one, the ATtiny48. It runs at 8MHz max so it isn’t that fast and doesn’t have an option for an external crystal. I suspect that even if it could run at 16/20MHz it may not be fast enough for detecting data from the GBA so what I decided to do instead was have the CPLD communicate to the ATtiny48 directly; once data was ready it could potentially just set a pin high and then read out the data whenever it wants. 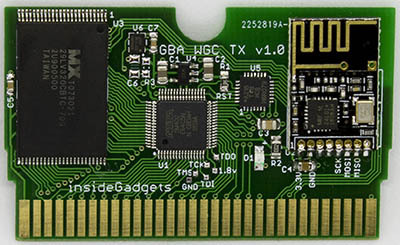 We didn’t need a CPLD with the Gameboy TX cart but we’ll need one for the GBA due to the way the GBA uses all 24 pins to set the address then latches the lower 16 bits of the address by setting CE low and it uses the lower 16 pins to read/write 16 bits of data. 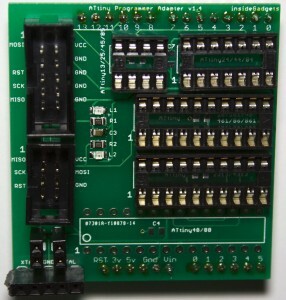 There is a way to increment the lower 16 bits by pulsing the RD pin which is also used. 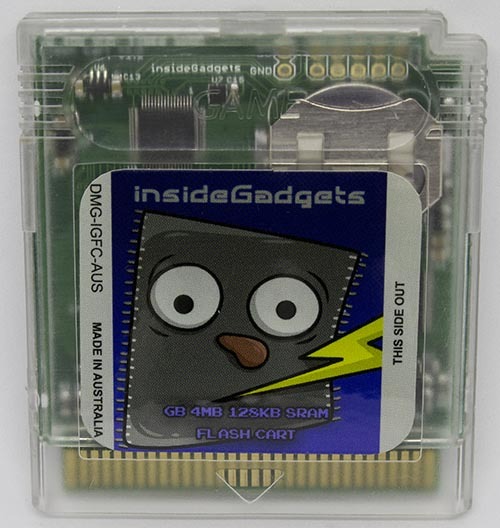 In some ways it’s easier than having to make an MBC like on flash carts. 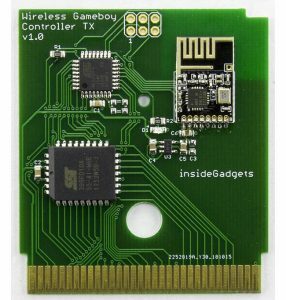 Since making the the Wireless Gameboy Controller, there were some ideas thrown around about making other devices of it wireless, one of them was the Gameboy Link Cable which we’re going to look at today. 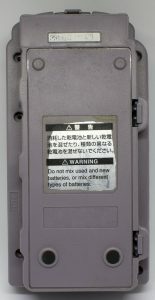 There are different link cables – one for the Gameboy and another for the GBA. I ordered both but only the Gameboy link cable had all the pins on the connector where as the GBA only had the ones it needed. 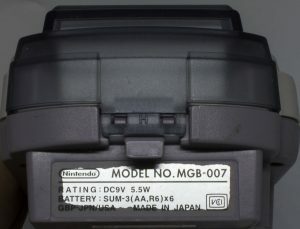 The GBA connector won’t fit in the Gameboy but the Gameboy connector will fit into the GBA. Let’s take a look at the link cable pinout. We have 5V, serial out, serial in, clock out and ground, seems easy enough. Out comes the logic analyser to take a look at the signals, the game I was trying the multiplayer on was F1 Race and with just 1 end of the cable connected. 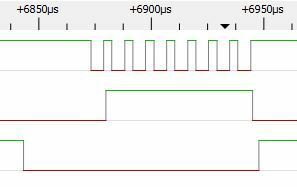 We can see the clock is slow (120us per cycle) and that the serial in is high, serial out is low so it doesn’t seem to be sending anything. The F1 Race game shows that you are the only player in the game and you can continue on to the race. When the other side is plugged in, we can see the SIN goes low. F1 Race now waits on the screen like we are waiting for other players. Previously we were able to use 2 carts to communicate to each other to play Pong with a little mod and some code changes. This time as per some users request, we’ll be taking a look at adding a Gamecube receiver which will emulate a Gamecube controller. 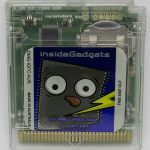 This could be useful if you wanted to play Gameboy games on the Game Boy Player or the Virtual Console / GC mode on the Wii. 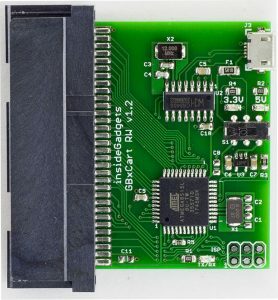 After a quick check on what was out there already about the Gamecube controller interface, I came across the int03 site which gives us the controller pin out and that it’s a serial interface which is held high to 3.4V and is pulled low. 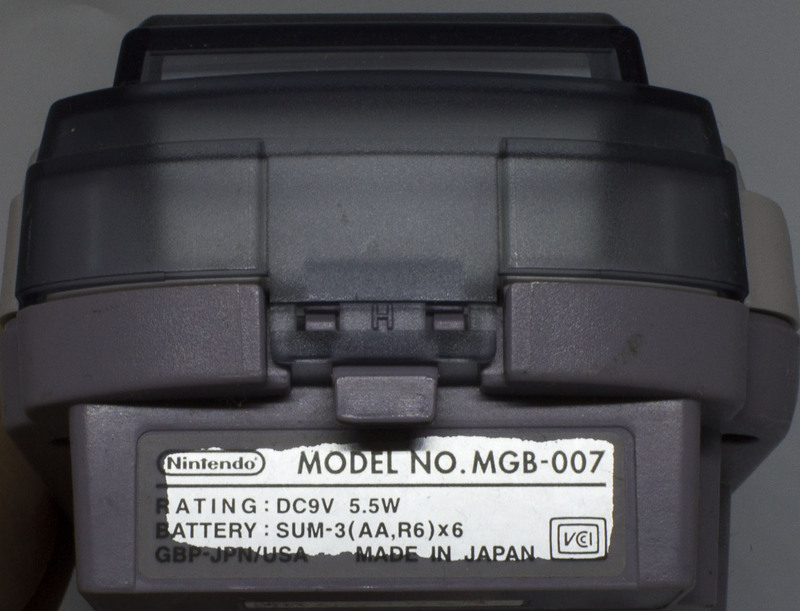 It looks like the Gamecube polls the controller which replies back with the button presses however the website mentioned that at first the Gamecube sends eight 0’s but they don’t appear to have the communication after that, how they reach the Gamecube requesting the controller state. It looks like we’ll have to capture the initial communication with a logic analyser and also re-confirm their findings so I took apart my Gamecube controller and wired it up to take a look. Firstly it seems like the Gamecube polls the controller at varying polling times, it may depend on whether you are in the system menu or could possibly depend on the game. We have a poll then 1ms later another poll which might be for debouncing and then 19ms after we have another 2 polls. On another instance we have the first two polls then a poll after 9ms and then the other 2 afterwards. 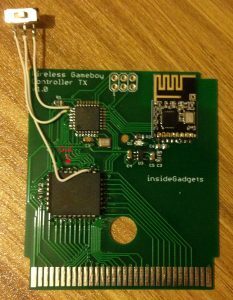 Previously we put together a Wireless Gameboy Controller using an ATmega to read the key press data which the Gameboy sent at a special address and then it was transmitted via an nRF24L01 to a USB device acting as a HID Joystick controller. 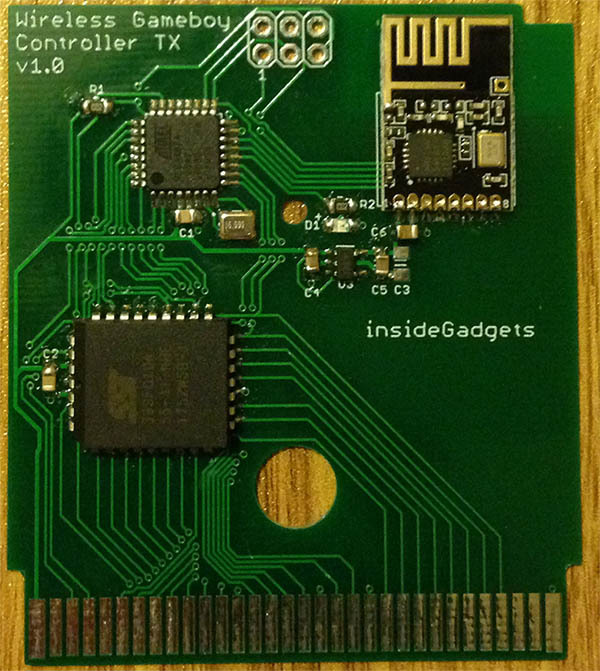 Everything worked nicely so I laid out the cartridge and USB receiver boards, sent it off, received the prototypes. The cartridge worked first go however when putting on the top half of the case, it was a tight squeeze and was difficult to remove because the nRF module was blocking it’s path, so for the final board I’ll have to move it down a little. 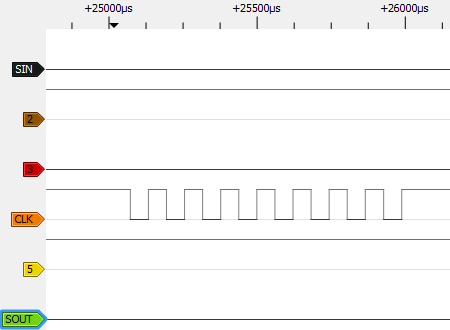 For the USB receiver, I ended up getting the nRF DO/DI pin mixed up so random data was being received. Not to worry though, I recalled that the ATtiny841 swapped the DO/DI pins for whatever reason compared to the ATtiny84. 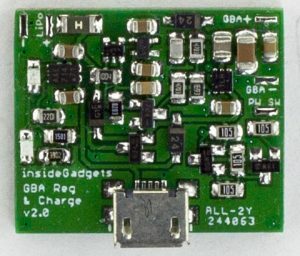 I soldered on the ATtiny841 and it all worked fine too. I’ll put some clear heat shrink over it once testing is complete. I wanted to add a method of changing and saving the nRF channel/address to the ATmega’s EEPROM so I made the GB program detect if the start button is being held down to boot into the configuration menu. We can now adjust our channel or address, this could be useful if you had multiple receivers and wanted them all to have the same address/channel or if you had some Wifi interference. For saving this configuration to the EEPROM we need to choose a different address than 0x7000 which is used for our key presses, I went with 0x5000 for the channel and 0x6000 for the address (of which we only store the last byte of it). 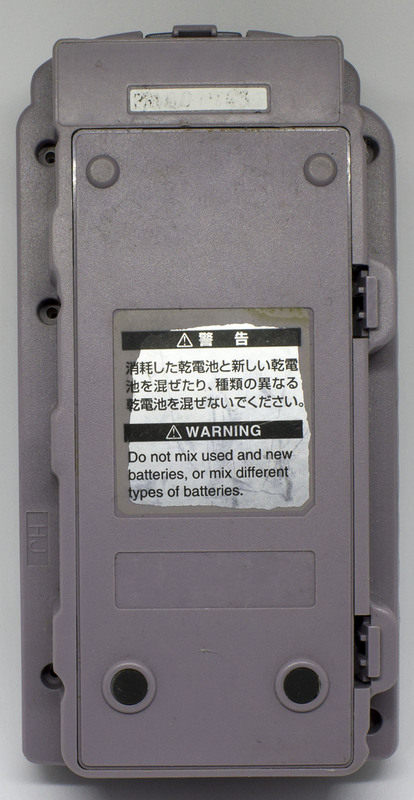 In Part 6, we looked at upgrading the Multi-game feature to allow for mixing GB/GBC games by using a hardware reset on the Gameboy plus we added the ability to switch the CPLD to select MBC3 or 1 mode (MBC5 is the default) when using the loader. 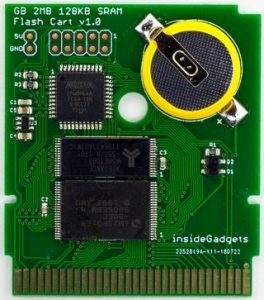 One issue I wasn’t able to solve was why the GBP didn’t seem to work with the multi-game loader (it doesn’t work on the “22 in 1” cart either) so we’re going to have a look at that and also look at possibly making a new larger sized flash cart using 3.3V flash. 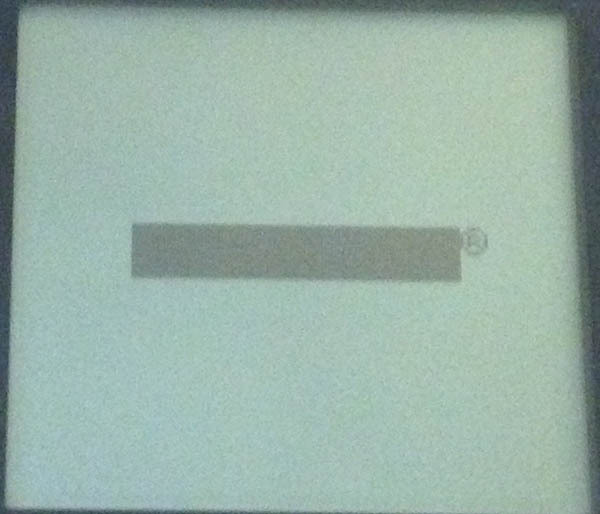 When trying to boot a game from the multi-game loader, we just receive a blank Nintendo logo. If I perform a manual hardware reset, it resets it back to the loader menu fine. It felt like perhaps the bank to switch to wasn’t being set correctly, so I tried manually setting a bank in the CPLD when we triggered the reset and that worked without any issues. This leads me to believe that the GBP isn’t outputting the data fast enough in order for the CPLD to pick up the bank before it resets. So after playing around for a while, I decided to switch back to executing the commands from the HRAM and adding another stage to the loader to do the reset after the multibank variable is loaded. insideGadgets © 2019 All Rights Reserved. 53 queries in 0.157 seconds.